Boldt Castle is a beautiful mansion, which today is a symbol of the love story of George C. Boldt and his wife Louise, which, unfortunately, has a sad ending. Multimillionaire owner of the famous Waldorf Astoria Hotel in New York and the Bellevue-Stratford in Philadelphia decided to raise this impressive mansion in the sign of the most pure and sincere love for his young wife, who also failed to see the finished appearance of the monument of their love . Boldt Castle is today one of the most interesting tourist attractions in the region 1000 Island (Thousand Islands), on St. Lawrence River. This is a beautiful area on the border between the U.S. and Canada, right on Lake Ontario, which has more than 80 km of lining small and large islands . 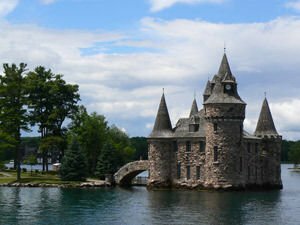 The exact number of islands is 1865 and Boldt Castle is a prime location, located on the island of Heart Island. Islands from the Canadian side of the border is considered part of Ontario, while the islands belong to the U.S. state of New York . Boldt and other islands, ranging from 0, 09 m2 to 2, 59 sq. km is located near Alexandria Bay. In 1860, Mr. Boldt arrives in America with literally a dollar in my pocket and in the years managed to become one of the most influential people in the country. Multimillionaire is a model of how one man can build a huge and profitable industry thanks to his organizational skills, daring and imagination through which he became the most successful hotel magnate in America. At the beginning of last century, Boldt owns the Waldorf Astoria Hotel in New York, Bellevue-Stratford in Philadelphia, president of several other companies, sponsor of Cornell University and director of the Hospitality Association in New York. According to the tragic, yet beautiful love story of Boldt, the hotel tycoon plans to build an incredible castle Boldt as a symbol of pure love for his wife Louise. She was only 15 years old when they were married and accompanied her men throughout his way to the top. Boldt wanted to donate to Louise the castle on the top of Valentine in 1905. But one year before the castle Boldt was to be completed Louisa died, 41 years of age. Overwhelmed by the enormous loss multimillionaire stopped the construction of the semi finished palace and never returned to his island. In 1916 Boldt died, and the castle was purchased by Edward John Noble, which is owner of Beechnut Fruit Company. He invested a lot to turn the area over the next 50 years into an excellent tourist destination, building the marina and the complex. Campaign for construction of the castle Boldt and luxurious complex around it began in 1900. To build one of the biggest names in America at that time, Mr. Boldt employed over 300 craftsmen, bricklayers, stonemasons, landscape engineers and other professionals. Of all the buildings in the area of 1000 islands, Castle Boldt is supposed to be the most beautiful. Boldt Castle itself is supposed to be a replica of European palaces of 16 century medieval forms of combining traditional elements with modern times, huge balconies and windows. Boldt palace was built over 6 floors - from the lowest level in a swimming pool to cover high tower. The castle has 120 rooms which are serviced by a lift. Everywhere you can see a generous and stylish interior decoration. Castle Boldt has 365 windows from which there is a beautiful view of the St. Lawrence River. Today the palace is accessible only by water, by organizing special courses with a tourist boat. On the ground floor of the castle Boldt is shown an exhibition on the life of millionaire Boldt and his wife Louisa. A walk around the island offers a lot more memorable moments. The east end is located a clock tower in medieval style. Particularly interesting is the tower Alster, which is the first constriction erected on the island. It was built on the model of defensive towers in the Middle Ages along the German river Alster.